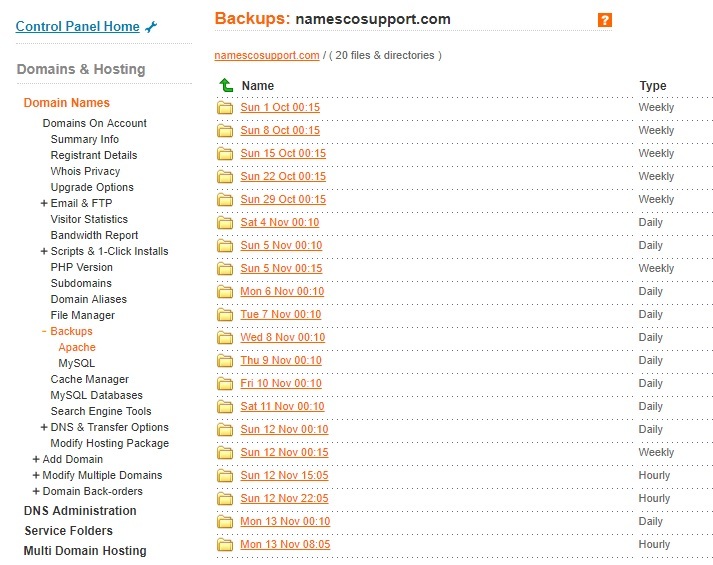 This article will show you how to restore your site to an earlier version using the Apache Backups tool from within your Online Control Panel. Please note that in order to use this feature you will need to purchase the Apache Backups package. This add-on service can be purchased from within your Online Control Panel, as shown below. 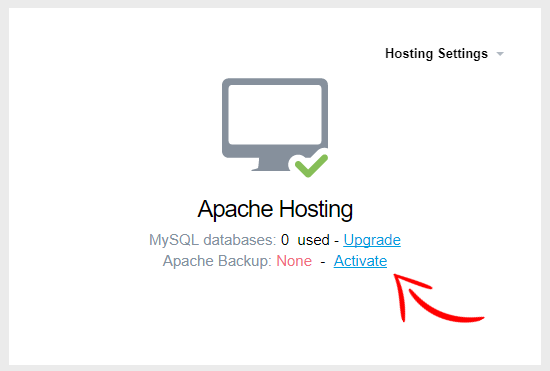 Once you have activated Apache Backups you will have access to your historical website data. 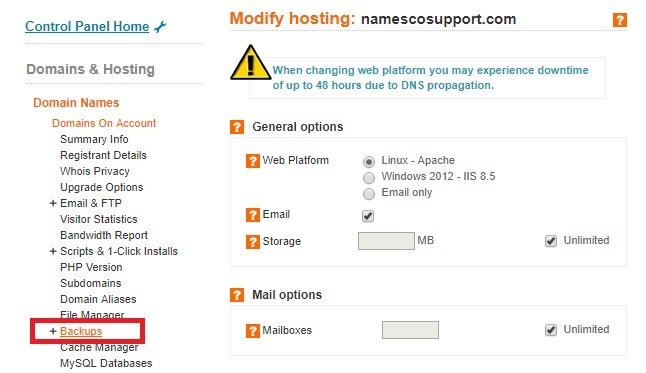 Firstly, from the Control Panel Home, click on Manage Hosting next to the domain name. 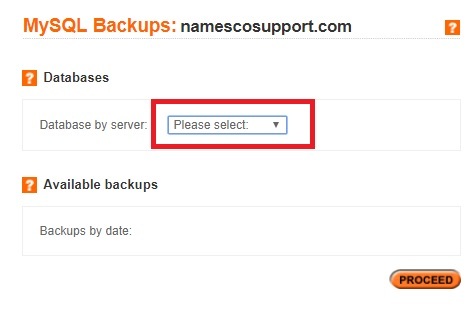 On the next page click on the option for Backups on the left hand side. This will open up a sub menu on the left hand side where you will be presented with the following options. Let's start by looking at how to restore historical web files. You will see various dates and times to choose from. You will need to select the date and time which best matches the backup you would like to restore. Once you have selected a specific date, you will be presented with all of the folders and files which were present at that time. To restore the entire web content, you can simply check the box next to the web folder, and click Restore. You can also restore a specific file or folder within the web folder as shown below. Your restored files will then be available within your File Manager in a folder called Restored. 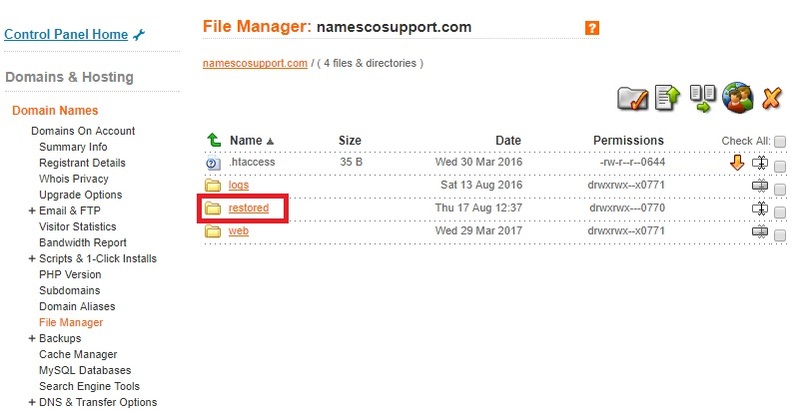 You can then move or copy these files over into your web folder, either by using the File Manager or FTP (File Transfer Protocol). We will now take a look at how to restore your MySQL database from an earlier point. By choosing the option for MySQL (as shown above) you will be presented with the following page. You will need to select the database you wish to restore by using the drop-down menu. Next, choose the date that you wish to restore the database from, and click Proceed. You will then see the following message displayed at the top of the page. The database will then be available within the Restored folder of your File Manager in the form of a .sql file. You can then download this file and import it into a new or existing database. If you are unsure on how to import a .sql file into a database, please see our support guide on how to do this.